Keeping the sacred remembrance of Lord Shiva in mind, the time has come again for planning Amarnath Yatra in 2019. Performed by thousands of devotees annually, Amarnath Yatra holds a special place in the heart of every devotee of Lord Shiva, who desire to embark on this holy pilgrimage once in their lifetime. While some devotees of Baba Barfani are fortunate enough to take this demanding journey several times, for some even one Darshan (sight) of the sacred Ice Lingam is equal to thousands of pilgrimages. Whether you are a regular Yatri or the fortunate first- timer, this article will help you to plan your Amarnath Yatra very well! In this article while shedding light on most important aspects of the Amarnath Yatra, from registration to alternate routes for Darshan which the devotees can follow, we have endeavored to make your pilgrimage journey to Amarnath Cave as accessible and simple as possible. So, go on and pay your homage to Baba Barfani (Lord Shiva) and secure grace of the Lord to bless your life in this world and your journey hereafter. For the devotees of Lord Shiva in particular and all the Hindus in general, Amarnath Yatra holds huge spiritual significance. The importance and presence of the Amarnath Cave and the Yatra is mentioned even in the Puranas as well as many other important religious texts. After the rediscovery of the cave in the modern times, it became a significant site of Hindu pilgrimage in the Kashmir valley. Every year, devotees of lord Shiva reach the Amarnath cave, boldly facing the cold weather and tough pathways, to seek peace and tranquility as well as looking to wash away their sins. There is a legend associated with the Amarnath Cave. According to the legend, when Goddess Parvati, the divine consort of Lord Shiva, asked Him that when and why He started wearing the beads of heads, the Lord Shiva answered that whenever she is born, He increases one more head to the total of bead heads. To this Goddess Parvati said that she has to die again and again, to be reborn, but, Lord Shiva is immortal. She requested Him to tell the secret of His immortality. The Lord replied that the secret lies in the Amar Katha (immortal story). After consenting to tell Goddess Parvati the Amar Katha, the Lord took refuge in the Amarnath Cave. He created a divine Rudra form called Kalagni and ordered him to destroy all living beings in the vicinity so that no body is able to listen to the story. However, an egg remained protected under the deer skin seat of the Lord and the pair of pigeons born out of this egg became immortal after listening to the Amar Katha. These pigeons can still be seen by many pilgrims although survival of any bird form in this high altitude and cold temperature is virtually impossible. Amarnath Yatra 2019 is conducted every year in the month of Shravan, which is an auspicious month, dedicated to Lord Shiva. In the year 2019, the Amarnath Yatra will begin the month of June and will conclude by August. This year the holy yatra is open for 60 days unlike the other years which lasted only for 45 days. With the year 2013 onwards, every pilgrim to Amarnath Yatra has to carry a compulsory medical certificate in order to prove his/her fitness in order to undertake the pilgrimage. This medical certificate can only be issued by registered medical practitioners and authorized institutions, the list of which is provided by the Shri Amarnath Shrine Board (SASB). Moreover any individual below the age of 13 and above 75 is barred from taking the pilgrimage due to its arduous nature. Women with about six weeks of pregnancy are also not allowed to embark on the Yatra due to medical reasons. The Shri Amarnath Ji Shrine Board (SASB) arranges for the registration of the yatris (pilgrims) through the medium of authorized, different branches and banks throughout India. These banks and branches are fully responsible to issue the Yatra Permit of Amarnath Ji (YP) based on the details provided by the applicant on the application form. The following are some vital steps involved in the registration for Amarnath Yatra in the year 2019. Amarnath Yatra registration begins on March 1, 2019 from 440 branches of the Punjab National Bank, the Jammu and Kashmir Bank and the YES Bank across the country, and is done on the first come-first serve basis. Each branch has been allotted a fixed quota of permits to issue for each day and for each route. The bank ensures that the number of permits issued does not exceed the number allotted per day and per route, every day. One Yatra Permit (YP) is valid for one pilgrim only. Every Yatri has to compulsorily submit the application form along with required health certificate to obtain the permit. The format for the application form and compulsory health certificate is available online as well as is available free of cost from the designated bank branches. No Yatri below the age of 13 and above the age of 75 is allowed to undertake the Yatra. Moreover, women with pregnancy of 6 weeks or more are also barred from carrying out the pilgrimage. Completely filled in application form. Identity proof of the pilgrim. The registering officer at the bank can register for the permit even after normal working hours, i.e. between 3 PM to 6PM. Food and drinks for the pilgrims of Amarnath Yatris are specifically organized in camps, through the courtesy of Shri Amarnath Ji Shrine Board (SASB). However several NGO’s and private enterprises also arranges for the food for the pilgrims as a service gesture. Due to harsh conditions during the Yatra, devotees are advised to stay away from oily, fried or greasy food. Intake of intoxicants and non-vegetarian food is strictly prohibited during the Yatra in 2019. 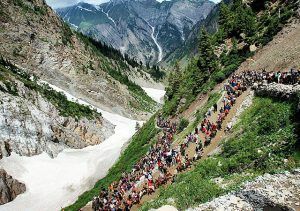 The route of Amarnath Yatra from Pahalgam has always been the preferred route for most of the travelers. Although it is relatively longer, it is easier than the path through Baltal. The total length of this trail is from 36 to 48 kilometers depending upon devotion and willingness of the pilgrim. One will find maximum number of devotees, ponies, pithoo carriers along this route only. Younger, aged, sick or people with past history of illness perform their pilgrimage along this path. Starting from Srinagar, many devotees also follow this route that runs through Baltal, Domial, Barari, Sangam and stretches 14 kilometers in length. This route is relatively tough due to its steep ascent and it is generally avoided by the older and sick people. This route is taken more by young, healthy individuals looking for some adventure. 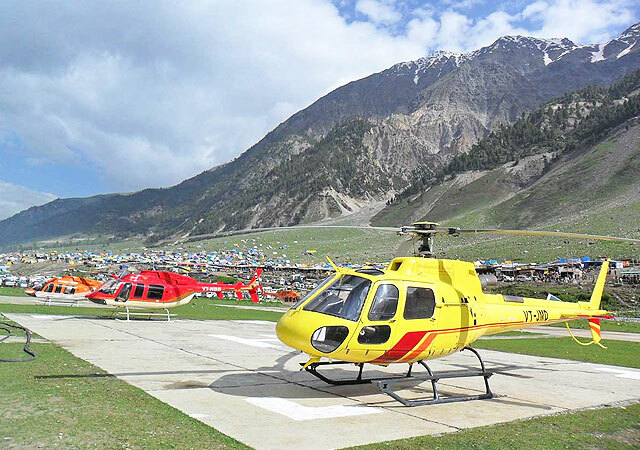 Amarnath yatris can book helicopter ride from both routes. These rides are organized from Neelgrath (near Baltal Camps) and Pahalgam and it normally takes around 10 minutes to reach Panjtarni, located about 5 kilometers away from the Cave. Pilgrims have to cover the last 5 kilometers on foot/pony/pithoo. Moreover, pilgrims don’t need a Yatra Permit for the helicopter journey, although they would still be required to produce the Compulsory Health Certificate (CHC) needed to undertake the Pilgrimage. It is one of the most preferred option for old, sick, people with past illness as well as physically weak individuals. It saves a lot of time and energy. For instance, a devotee can sight (have Darshan) of the lingam and be back in the same day. It avoids the unnecessary hassle of obtaining the Yatra Permit. Anyone with a valid Compulsory Health Certificate (CHC) can take the helicopter ride to Amarnath Shrine. The trip affords great views of the beautiful surrounding snow-clad hills and majestic valleys. The fascinating Indus River is also visible from above, during the Amarnath journey. Wear warm woolen clothes and carry ample separate pairs of clothing with you. You need to do thorough groundwork to endure harsh terrain and unpredictable climate. Other important things that you must carry with you are-wind-shield, raincoat, small umbrella, a woolen cap, a torch, stick, waterproof shoes, woolen socks, trousers, sleeping bag etc. Follow the instructions issues by the Yatra administration thoroughly. Keep a slip carrying your name, address, phone number of closer kins as well as name of the accompanying yatri in your pockets. Carry important medicines like Aspirin and other pain relievers or pills like sorbitrate for any medical emergencies and always be ready to help your co-devotees for any kind of help. Wear suitable, preferably loose clothes and avoid wearing slippers. Keep your mind pure and keep chanting “Om Namah Shivay” throughout the journey. Avoid taking drugs or other intoxicants during the Yatra. Keep away from, oily, fried or greasy food during the Yatra. Avoid stopping at such places as has been marked by a warning sign. Do not take any short cuts as these can prove very dangerous. Do not over strain yourself or overtly challenge yourself. Children and over-aged people are specifically advised not to undertake the Yatra. After reaching Srinagar (either by road or air), the journey to Baltal base camps goes through Sonamarg. Presenting spectacular views of the countryside, the drive leading to Sonamarg tread thorough the picturesque “Sindh River”. Perched at a height of 2730 m, Sonamarg is a beautiful hill station of Kashmir and a tourist destination, presenting a wonderful backdrop of snowy mountains in front of the azure sky. From Baltal base camp, you can start Yatra to the holy shrine. Pahalgam is the traditional base camp from where the Yatra normally begin. Travelling by road from the rest of India, one reaches Jammu first from where Pahalgam is approximately 315 kilometers. One can either opt to reach Pahalgam by road or fly from Jammu to Srinagar before travelling a distance of 96 kilometers further to reach Pahalgam base camp. Devotees can board the helicopter for the shrine from the Neelgrath helipad. The journey normally begins after 9:00 Am (Depending on climate conditions) and it merely takes 10 minutes to reach Panjtarni, situated 5 km from the holy site. Devotees are advised to reach the helipad on time and wear thick woolen clothes before getting on the helicopter. The journey begins from Pahalgam helipad. Helicopters from the site normally operates between 9:00 AM to 5.00 PM, but it is subject to weather conditions. After de-boarding at Panjtarni, devotees carry on the remaining pilgrimage on foot. After Darshan at the holy shrine, visitors can return to Panjtarni to fly back to Pahalgam. 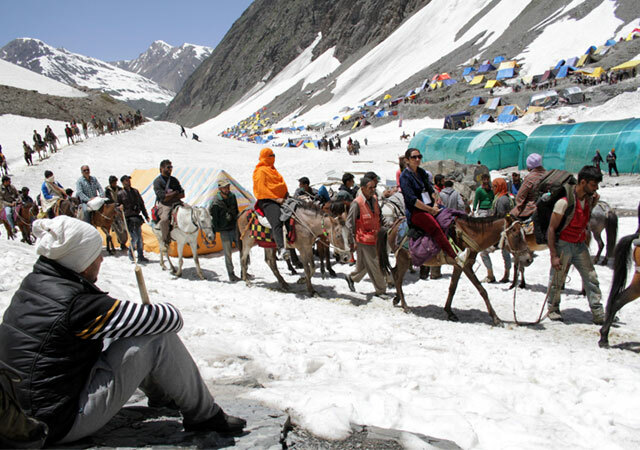 Accommodation for the pilgrims during the Yatra is arranged in tents by J&K TDC as well as private groups and as far as possible, all the necessary facilities are provided. However, pilgrims are guided to carry their own stuff for any individualized need. On the other hand, option for accommodation, in comfortable hotel rooms, is also available in the nearby town of Sonamarg before and after the Yatra. After getting over from the Yatra, pilgrims have plenty of options for sightseeing and enjoying around different towns and locations in Kashmir valley. Enjoy gondola ride in Gulmarg, soak in spectacular views of Aru valley and Betaab Valley in Pahalgam or revel in the houseboat ride in Srinagar and relax in exquisite Mughal Gardens of Shalimar and Nishat, there is no shortage of exciting and breathtaking locations in Kashmir. With tourism, slowly picking up momentum, this is best time to explore the magical and heavenly sights of India’s northernmost state. 2 comments on "How To Plan Amarnath Yatra 2019 – A Trip to the Abode of Lord Shiva"
Very nice article about Amarnath yatra and how to prepare for it. As all knows that Amarnath yatra is not easy as like other pilgrimage yatra’s but thanks to share this useful information with us.